On 27 December 2007 Shaheed Mohtarma Benazir Bhutto was martyred in the garrison city of Rawalpindi where her father – another great and popular leader of Pakistan – was hanged some thirty years ago by a mean, vindictive and a heartless military dictator. It is needless to underscore that like many other Pakistanis, I was totally devastated at this tragic end of a great leader. Who killed her? It is a million dollar question though. However it is very clear that her killer or killers hated her brilliance, beauty and boldness. These savages could not silence her messages so silenced the messenger, who remained a hope and aspiration of the poor of our country. They snatched away our Shehzadi from us – the symbol of democracy and a unifying force of the federation. It is hard to believe that she is no more and now all we are left with is her memories on this second shahadat anniversary of hers. We are only left to mourn her death and sing the requiem – our Pakistani requiem in her memoriam. Robert Novak in his Op-Ed, "Who Wants to Kill Benazir Bhutto" (30 October 07), was all praise for her boldness. He said, "When I interviewed Bhutto in New York in Aug-07, I asked whether she thought she might be killed if she returned to Pakistan. She answered by saying she must return. She gives the impression that being in danger is her fate". It is beyond doubt that, like her father, Benazir Bhutto was a brave and a bold lady. When she embarked on her historic return journey to Pakistan on 18 October 07, she was fully cognizant to all the dangers to her life. She was being intimidated by all, especially from Musharraf's henchmen. Day in and day out her opponents were issuing statements in the press with a view to deter her from returning. Some even had stretched as far as warning her of dire consequences should she insisted on returning. But the world witnessed that she boarded the plane from Dubai for Karachi and upon her arrival there she was greeted by a historic sea of people; never seen before in the history of Pakistan. During that fateful night of 18-19 October 07, her cavalcade was attacked by suicide bombers and some 170 of her supporters laid down their lives protecting her. She luckily escaped unhurt. The scene of deaths and destruction was simply horrific. Any body else would have confined to one's home out of trauma. But there you go; Benazir Bhutto was up and running the next morning. She addressed a press conference and visited the injured party workers in the hospital and also visited their families at their homes; all of these activities in one day despite security threats to her own person. The great testimony to her boldness comes from her take on Taliban. While Musharraf was chickening out by surrendering to their terror, Benazir Bhutto was very clear from the outset. She had said then, "The Taliban seek deaths and we must give them one". This meant she was dead against any talk with the Taliban and wanted some concrete and concerted military operations against them which Musharraf was not ready for. It is heartening to note, however, that she seems vindicated today as the new military commander – General Kiyani – did go ahead with the needed military strikes to destroy their sanctuaries in the lawless tribal areas. Benazir Bhutto was a gifted lady – a brilliant soul. Even her staunch critics, both at home and abroad, accepted the fact that she was indeed a bright leader with brilliant ideas and immense qualities". In her last book, "Reconciliation – Islam, Democracy & the West" (published after her death), Benazir Bhutto has proposed a brilliant idea that could help to restore communication, trust, and dialogue between the Muslim world and the West. The idea is the creation of a Reconciliation Corps, modeled on the Peace Corp. According to her it would be made up of Muslims from Western societies who have been economically, socially, and politically integrated into the life of their host countries while maintaining their Islamic character, culture, and religion. By proposing this Reconciliation Corps, she in fact has envisaged that these Muslim youths could build bridges with their countries of origin. The American-Pakistani Foundation launched publicly by Secretary of State – Hillary Clinton – on 11 December 09 just echoes what Benazir cited in her last book. Benazir Bhutto had the extra-ordinary beauty to captivate any body and possessed the charm and charisma of her father. Like her father, she was loved both at home and abroad. She was the only politician who had toured the entire Pakistan, city by city, town by town, village by village and hamlet by hamlet at least five times. She knew the party workers by face and the towns by the streets. She knew in detail about the winner and the runner-up in each and every constituency from Karachi to Khyber. The world also admired her brilliance, beauty and boldness. This is the reason she was declared the MSN Lifestyle Most Influential Women of 2007. Unfortunately enough she was murdered just a day later. She was conferred a posthumous award for her meritorious services in the field of democracy and humanity in Paris in June of 2009. In January 2009, a portion of the famous Clark Street in Chicago was named after her. And, in the same month the newly inaugurated Bangladeshi parliament also unanimously adopted an obituary reference in her honor. These are undoubtedly great honors which very few world leaders were bestowed upon. Like the Pakistani people, the entire world leaders mourned her death. The news of her death had captured the World headlines immediately and the electronic media, the world over, covered this sad news for days and weeks together. Mary Robinson, the President and Chair of the Council of Women World Leaders remarked on her death by saying, "It is with great sadness, the Council of Women World Leaders lost one of its Members. The assassination of Benazir Bhutto was a great loss for the people of Pakistan". All other world leaders had also sent messages of their condolences. Pakistan had declared three-day mourning in her honor. One of the best tributes in fact has come from Aitzaz Ahsan – her erstwhile comrade. 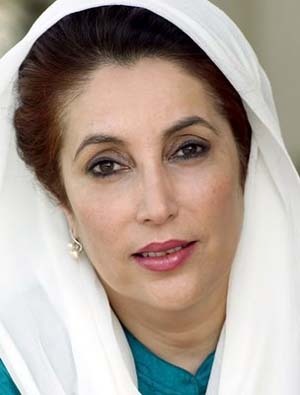 In his article, “Memoriam – Benazir Bhutto", he said, "The Himalayas wept the death of your father. The world weeps for you”. Giving a startling clue as to why Benazir was so mercilessly killed, he placed a question and then answered the same, “Why during the 30 years from 1977, when an elected and a popular prime minister was ousted at gun point to the date when Bibi lost her life to another gun, the total period for which she, the most popular political leader, was allowed to govern the country was three times less than the time Chaudhry Shujaat’s party remained in power? In kowtowing to the civil and military bureaucracy there is a premium. He and his likes can do it. She could not. They survive. She had to be eliminated”.